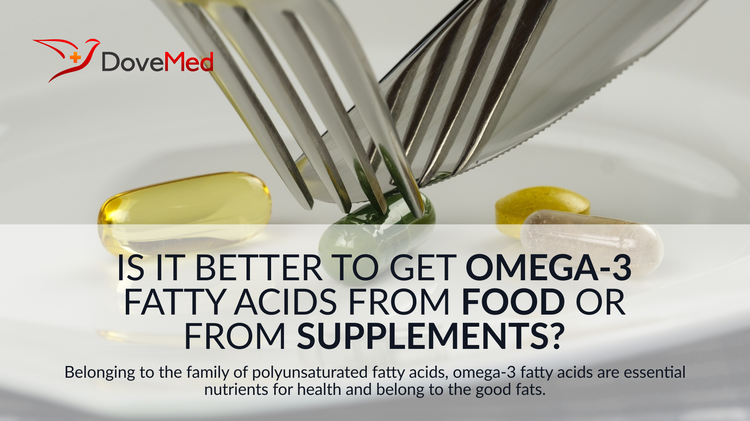 Is It Better To Get Omega-3 Fatty Acids From Food Or From Supplements? Apart from eating foods rich in omega-3 fatty acids, one may gain access to it through omega-3 supplements. However, the consumption of foods to gain omega-3 is much healthier, as plants and fish that provide these polyunsaturated fats also contain vitamins, minerals, and other valuable proteins. Belonging to the family of polyunsaturated fatty acids, omega-3 fatty acids are essential nutrients for health and belong to the good fats. Omega-3 fatty acids are needed for normal body functioning and help in controlling clotting of blood, protection against cardiovascular diseases, to name a few. Omega-3 fatty acids are found in foods, such as fish, or may be in the form of supplements. There are three types of omega-3 fatty acids and these are: Eicosapentaenoic acid or EPA, alpha-linolenic acid or ALA, and docosahexaenoic acid or DHA. ALA is found in vegetable oils, like soybean, canola, flaxseed, and walnuts. Also, vegetables like kale, spinach, and some other green vegetables contain ALA. The other two types (EPA and DHA) are generally found in fatty fish. For achieving good health, one must aim to consume omega-3 through their diet every day. Omega-3 fatty acids have a strong connection with protecting the heart. The Japan EPA Lipid Intervention Study points out those participants who took EPA and a cholesterol-lowering statin were less vulnerable to sudden cardiac death, fatal or non-fatal heart attack, or a bypass operation to unblock a coronary artery. Apart from eating foods rich in omega-3 fatty acids, one may gain access to it through omega-3 supplements. However, the consumption of foods to gain omega-3 is much healthier, as plants and fish that provide these polyunsaturated fats also contain vitamins, minerals, and other valuable proteins. For vegetarians, those who do not consume fish might consider taking supplements that contain ALA. But, even for vegetarians it is not a necessity to consume any omega-3 supplements. If one gets adequate quantity of omega-3 fatty acids from soybean, canola oil, walnuts, or flaxseeds, then consumption of supplements may not be necessary. According to a study by Tufts University, salmon contains 1.7 grams of total omega-3 fatty acids in a 4 oz portion. The same portion of tuna contains 0.3 grams of the polyunsaturated fatty acid type. Walnuts contain the maximum number of omega-3 fatty acids, which is 2.6 grams for every ounce. Half a cup of spinach contains about 0.1 grams of omega-3 fats. EPA and DHA may also be effective in managing depression and cognitive issues. Researchers from the University of Pittsburg pointed out that low level of EPA in the body is likely to affect the mood and emotions of a person. A second study in addition to this research quoted that the amount of omega-3 fatty acids consumed in the diet caused the brain to regulate the emotions. Though consumption of foods rich in omega-3 is recommended, there are even studies that support having supplements to protect one’s health. In the GISSI Prevention Trial, heart attack survivors who consumed a capsule of 1 gram omega-3 fats every day for about three years were found to have a less likely chance of another episode of heart attack, stroke, or sudden death. If one gets their share of omega-3 fatty acids from foods, then there is no requirement for availing omega-3 fatty acids through supplements. However, if an individual is already a heart patient, then it is important for them to consume supplements along with foods, so that the omega-3 fatty acids are well absorbed in the body. Meyer, B. J., Mann, N. J., Lewis, J. L., Milligan, G. C., Sinclair, A. J., & Howe, P. R. (2003). Dietary intakes and food sources of omega‐6 and omega‐3 polyunsaturated fatty acids. Lipids, 38(4), 391-398. Wang, C., Harris, W. S., Chung, M., Lichtenstein, A. H., Balk, E. M., Kupelnick, B., ... & Lau, J. (2006). n− 3 Fatty acids from fish or fish-oil supplements, but not α-linolenic acid, benefit cardiovascular disease outcomes in primary-and secondary-prevention studies: a systematic review–. The American journal of clinical nutrition, 84(1), 5-17.